A new fintech and crypto hub is set to be built at Philippines’ Cagayan Special Economic Zone and Freeport (CSEZFP), which is located in the Northern Luzon region. This new facility is in line with the government’s vision to foster a fintech ecosystem and attract international blockchain companies to set up shop in the country. Called Crypto Valley of Asia, it will be developed by the Cagayan Economic Zone Authority (CEZA) alongside private developer Northern Star Gaming & Resorts Inc.
Northern Star has secured international and regional companies to locate within the CVA estate, which will be rolled out in three phases. It has also committed gross investments valued at US$100m over the next 10 years. Ultimately, the goal is for the CVA to generate an economic boom that will allow more Filipinos to pursue careers in technology. Additionally, the hub will provide employment for third-party business providers (BPO) who service the fintech and cryptocurrency sectors. 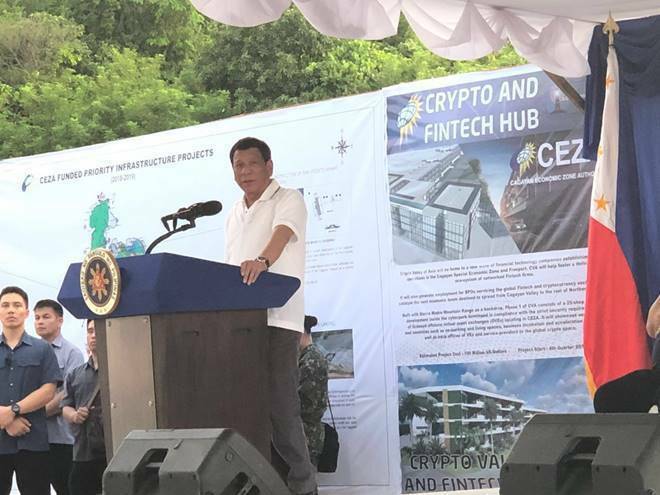 Guest of Honor Philippine President Rodrigo R. Duterte said that CVA is a critical infrastructure that will serve to attract more foreign investors and global fintech players to CEZA and the Philippines. On the opportunities provided by technology, Duterte adds that the investments will eventually help nurture the younger generation. CVA will be home to a new wave of financial technology companies establishing their operations in the CSEZFP, and will also generate employment for BPOs servicing the global fintech and crypto currency sectors. It will include co-working and living spaces, business incubation and acceleration hubs, as well as back offices of overseas virtual exchanges (OVEs) and service providers to the global crypto space. There will also be an internet data centre, crypto mining firms, and self-contained power production facilities. “Crypto Valley of Asia and CEZA will put the Philippines on the global map of fintech and blockchain. Similar to other progressive jurisdictions such as Zug of Switzerland, we will create an environment that fosters innovation, entrepreneurship and critical skills development through education and BPO training,” said Enrique Gonzalez, chairman of Northern Star.